Two of my favorite things in the world of food are vegetables and Italian cuisine, and they’re highlighted together in The Glorious Vegetables of Italy , which is the latest book from Domenica Marchetti. I recently received a review copy. It’s not a strictly vegetarian book, but almost every dish presented could easily be made without meat. The chapters are ordered from antipasti to dolci with recipes for every course in between. It was delightful to see vegetables in starring roles in each dish and to read about how the recipes came to be. In the Garlicky Lentil Soup, there are carrots, fennel, potato, and turnip, and Domenica explains how she adds crunchy croutons to each serving just as her mother always has. The Crepe Cannelloni with Mushrooms and Zucchini topped with balsamella sauce and baked until browned, looks like ultimate comfort food. We learn that crespelle, or Italian crepes, are traditional in Abruzzo which is the author’s family’s native region. The Smashed Green Beans and Potatoes with Pancetta is something I will definitely be trying even though I’ll leave out the pancetta. The green beans are cooked with the potatoes until completely tender, and then they’re mashed together with olive oil. I already imagine this dish making several appearances in meals this fall. Then, there’s the Pumpkin Gelato made with chestnut honey that I can’t wait to try as well. In the Pasta chapter, a certain recipe reminded me of something I used to make frequently. I have no idea why it fell off my radar, but it had been ages since I last made ravioli nudi. I used to form the pasta-less dumplings and bake them in a tomato sauce. I used to make a ricotta and parmesan version, one version with added spinach and herbs, and even one with a mix of ricotta and silken tofu. 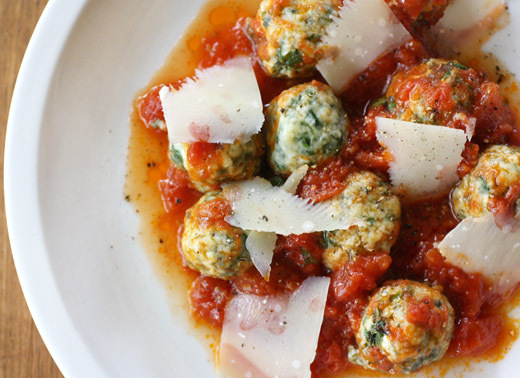 When I saw the page in the book with the plate of little nudi dumplings speckled with greens and topped with tomato sauce and shavings of parmesan, I couldn’t wait to try this version. This recipe is a little different from how I’ve made nudi in the past since these are formed into balls about the size of a chestnut. I remember making slightly larger dumplings. Also, here, they’re boiled rather than being baked in a sauce. The smaller size meant it was easier for them to cook through without spending too much time being jostled about in the boiling water. And, they’re daintier looking on the plate. The recipe in the book suggests using a mix of Swiss chard and spinach, but I went with what I could find at the farmers’ market which was chard and arugula. The tomato sauce on top could have been made from fresh tomatoes or canned. I didn’t have quite enough fresh tomatoes on hand, so I went the canned route. You could use canned diced tomatoes or canned whole tomatoes as I did. I think I saw Ina Garten chop canned whole tomatoes by snipping them, in the can, with kitchen shears. That’s what I did, and then the chopped tomatoes went into the saucepan with olive oil and garlic. The sauce simmered away while the nudi were rolled and cooked. The garnish is just a quick shaving of a block of good parmigiano reggiano with a vegetable peeler. 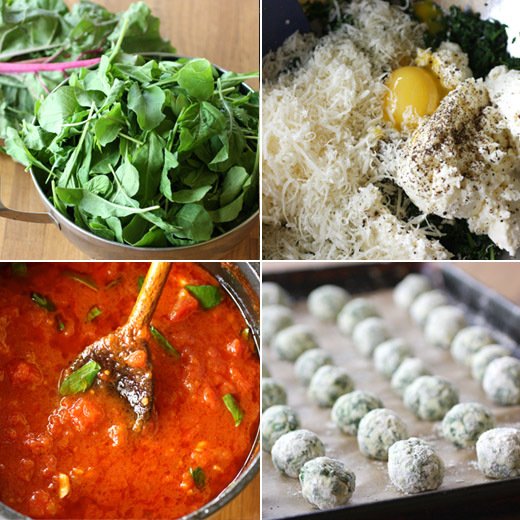 Making nudi is simpler than filling ravioli, but you still get all the great flavors of the mix of cheeses and greens. 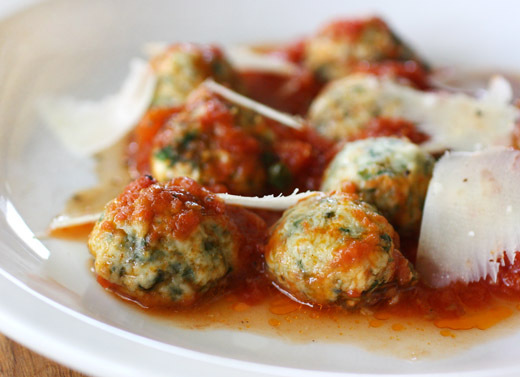 The little dumplings plump up as they cook and end up fluffy and delicious with the simple tomato sauce. I’m glad to have been reminded about this dish and to learn about several new ones too. Recipe reprinted with publisher’s permission from The Glorious Vegetables of Italy . Tender and delicate, these nudi—essentially, ravioli without the pasta covering—make an elegant first course for an early spring or fall dinner, dressed with a simple tomato sauce. They are also delicious served in soup; just boil the nudi as directed, then ladle hot vegetable or chicken broth over them and sprinkle with freshly grated Parmigiano cheese. For some reason, maybe because of their fluffy texture and gentle flavor, these nudi are a hit with children—no cajoling or bribing necessary. Rinse the shredded chard leaves in cold water. Place the leaves, with the water still clinging to them, into a large saucepan, cover, and set the pan over medium heat. Cook the chard, tossing it from time to time, for 12 to 15 minutes, until tender and most of the water has evaporated. Turn off the heat, and using tongs, transfer the chard to a colander and let it cool. Rinse out the saucepan and return it to the stove. Rinse the spinach leaves in cold water. Place the leaves, with the water still clinging to them, into the saucepan, cover, and set the pan over medium heat. Cook the spinach, tossing it from time to time with tongs, for 5 minutes, until tender. Remove from the heat and transfer to the colander with the chard to cool. When the greens are cool enough to handle, squeeze as much excess water from them as you can. Transfer them to a cutting board and chop finely. You should end up with about 1 packed cup of freshly chopped greens weighing between 7 and 8 oz/200 and 225 g.
Place the greens in a large bowl and add the ricotta, 1⁄2 tsp salt, a generous grinding of pepper, the nutmeg, the Parmigiano, and the egg yolks. Mix together gently but thoroughly. Sprinkle in the flour, and gently fold it into the mixture. Pour some flour into a small shallow bowl. Have ready a large rimmed baking sheet lined with waxed paper or dusted with flour. With your hands, pinch off a piece of the greens mixture, form it into a ball about the size of a chestnut, roll it in the flour, and set it on the baking sheet. Continue to form the nudi until you have used all of the greens mixture. Bring a large pot of water to a boil over high heat and salt generously. Carefully drop in 8 to 10 nudi. Within 1 or 2 minutes, they will begin to float to the surface. Continue to cook the nudi for another 5 to 6 minutes, until they have floated to the surface and are puffed up. With a large skimmer, remove the nudi and transfer them to a warmed serving bowl. Spoon about 1 cup of the tomato sauce over the nudi and mix very gently. Continue to cook the nudi until you have cooked them all. When they have all been added to the serving bowl, spoon additional sauce over the top and sprinkle with Parmigiano. Serve immediately. COOK’S NOTE: I love chard stems, so if the chard I purchase has tough stems, rather than discard them I slice them crosswise, sauté the pieces in a little olive oil until they are softened, and then stir them into the tomato sauce. Even though I preserve batches of tomato sauce to use through winter, I still rely on sauce made from good canned tomatoes from time to time. Using excellent-quality canned tomatoes and good olive oil is important to the integrity of this simple, everyday sauce. Look for canned diced tomatoes packed in their natural juice rather than in heavy, pasty puree. Warm the garlic in the olive oil in a large saucepan over medium heat. Use a wooden spoon to press down on the garlic to release its flavor. Cook for about 2 minutes, or until the garlic begins to sizzle. Don’t let it brown. Carefully pour in the tomatoes and their juice (the oil will spatter) and stir to coat with the oil. Season with 1 tsp salt and raise the heat to medium-high. Bring the sauce to a simmer, reduce the heat to medium-low, and simmer gently, stirring from time to time, for 30 to 35 minutes, or until the sauce has thickened and the oil is pooling on the surface. Remove from the heat and stir in the basil. Taste and add more salt if you like. If not using immediately, transfer the sauce to a container with a tight-fitting lid and refrigerate for up to 3 days or freeze for up to 3 months. A recipe I didn't know until yesterday and since then I saw it on my friend's Rosa's blog and yours. I've bookmarked it on ziplist and surely will be trying it soon. I like the use of chard in these little dumplings. Glorious indeed! It looks so fabulous and makes me doubly want this book! Thanks for sharing the recipe... I am so making these! Gosh, I haven't made ravioli nudi in years - typically I make the regular kind. But you're right that these are so easy. And I love Swiss chard in anything, but it's wonderful in ravioli. Good stuff - thanks. Your ravioli looks sensational! I've bookmarked it to try it myself. I flunked my attempts at ravioli 101, so these nudi look perfect. Your photos are marvelous, too, Lisa! I have never made ravioli nudi before. Love the combo of swiss chard and arugula! Looks divine! And light as well! Can't wait to try! Those ravioli nudi look absolutely mouthwatering. Totally love the use of swiss chard and arugula. Good Morning Lisa and hoping you've had a great holiday weekend. I have never heard of ravioli nudi and it looks divine. Tomatoes are just starting to ripen on my plants and I'm going to have a ton for making tomato sauce. I appreciate this simple recipe, as I was just going to Google something. Thanks for a great new Italian dinner recipe to try. I was looking for a similar recipe since several weeks because we ordered this dish in an Italian restaurant , it was so good but I didn't remember the name. I use that scissor trick to cut up whole canned tomatoes, too. Although I didn't remember it, I'm not surprised it's an Ina trick. Your nudi look terrific! I've never made them but they sound delicious. Hope you're surviving the latest heat wave. I'm ready to cry uncle and crawl in bed until summer is over. Here's hoping we get some relief soon. An impeccable recipe, down to the last flavorful spoonful of broth! The hallmark of a good dinner recipe is the ability to use similar ingredients and still produce an irresistible meal! Hi Lisa! I've never tried or made nudi before but I love the simplicity of the process. And I must agree...I love when Italian cuisine focuses on the vegetables. So very good! Thank you for sharing, sweet friend. I hope you are having a good start to your week! I love Italian-- I have to cook it, because there are no good restaurants in SA! I've been on the fence about getting this cookbook but for sure you've won me over! I wouldn't be able to stop popping these in my mouth! I made the crepe cannolli recipe from this book this weekend. Very Good! Followed the recipe exactly. Only comment about the written recipe is that it says it makes about 26 crepes but I only got 19 but it was plenty. your always preset the food in a fancy way lisa! Yum...sounds delicious and that bright red colored sauce is making it look even more so. It reminds me of the Indian koftas. Lisa, the nudi look beautiful! And really delicious - I love the idea of replacing the greens sine Swiss chard is impossible to find here - not to mention I love arugula. I absolutely love this type of recipe! Your gnocchi turned out perfect, I know these are a bit tricky to shape, but of course, you had no problems! i've never tried filling ravioli myself, and now i'm convinced to try nudi first. this sounds so flavorful and delicious!